One of the easiest ways to enhance your Google AdWords search ads is to implement Ad Extensions. 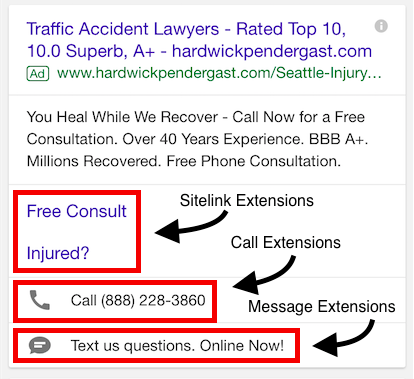 AdWords offers quite a few types of extensions, but some of them just don’t make sense in the legal industry. In this post, I’ll go through the different types of extensions, what they look like, and which are my personal favorite. These are essentially extra pages on your site that someone can visit directly from your ad in search results. You can choose which links you’d like to show up for specific campaigns or ad groups, which gives you the option to link the most relevant pages for that specific subject. Say you’re an attorney who practices both criminal and family law. You don’t want your DUI page showing up alongside your Divorce ad, so make sure you choose the correct level of placement. This adds your phone number to your ad. Mobile and desktop versions will have slightly different functionality since you can make a call directly from the mobile ad. This gives your potential clients a direct line of communication to your office without ever having to visit your website. This is a great option for those who already know they need a lawyer, or those who would rather talk to a real person to get answers about their specific case. Add two call tracking numbers, one for desktop and one for mobile, in order to track visitors who never actually visited your website. A location extension is a direct link to your Google My Business page (make sure your name, address, and phone number is correct!). What’s great about these is that not only can you get your address in your ad, but this also makes it possible for you to show up as an ad in Google Maps. A lot of people choose attorneys based on location. This extension allows you to be more visible for “near me” searches. Callout extensions are essentially short, call to action statements. If you offer free consultations, are a certified specialist, or accept calls 24/7, this is the place to share it. These are types of products or services you offer. This is where you can specify the types of law you practice, or break out sub-practice areas. Ex: Child Custody, Child Support, and Divorce. These are short reviews of your business, found on external sites. These are not automatically pulled from those sites, so you can choose which reviews you submit. Reviews are an important part of any business, but are especially important in gaining new legal clients. Of the available review extensions, these are the hardest to get approved, making them my personal favorite. If you’d like to learn my tips and tricks for getting reviews approved, join me for a webinar on September 13th! You can find more information and register here. These are similar to call extensions, but for text messaging. First, if you’re not open to receiving text messages, this isn’t a review extension you should use, and most potential legal clients won’t contact via text in the first place. But, if you’ve found this to be different for your practice, make sure you’re connecting a number that can receive text messages, or you’re using a call tracking service like CallRail that allows text messaging. Examples of multiple AdWords mobile ad extensions. This type of extension is only available to retail chains. They show searchers nearby locations of your retail store. It doesn’t. At least not yet. Once this extension is available to smaller, non-retail businesses, law offices with multiple locations will be able to benefit from this really cool feature. Price extensions give you up to eight cards to share prices for specific services. We don’t use price extensions for legal because most practices don’t have set prices for multiple services. This may be an option for some attorneys who have standardized services. This extension gives you the option to link to your mobile app. Since most attorneys don’t have an app for their services, this extension doesn’t really apply.